If you have the iPhone 5c, I definitely feel your pain. Not because it's a bad phone (it's actually quite nice! ), but because of the lack of cute cases. I mean when I bought the phone, there was only one kind of case available and that was the one that apple makes. Kind of unfortunate, until I found a few online that I'm now obsessed with. Kate Spade fiiiinally made some (isn't that glasses one too fun?) and I couldn't be happier about it. The striped one on the left is pretty darling too. Also, I found that Personalized From Me to You has custom monogrammed otter box cases (!!!) which I might have to splurge on #navyandwhitestripesplease. If you know of any iPhone 5c cases, please do share the link below! I love how the color peeks through the first two. I got a 5S when I upgraded but I feel your pain. When the 5 came out everyone stopped making cute iPhone 4 cases. It was hard to find a cute case for a while until I upgraded. Love the glasses one.... 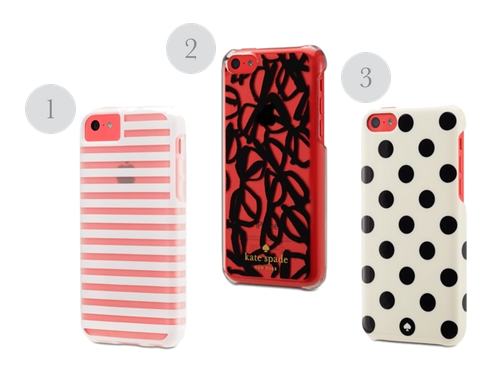 I still have the iphone 4 but all these cute cases make me want to upgrade! Such cute cases! I have an Android now, but seriously considering transitioning to the 5s! I've heard a lot of great things about the 5c, though!